Our guest bedroom didn’t always look like this. When we moved into this house, it became clear that decorating ideas needed to come thick and fast. The guest bedroom walls had chunks out of them and were painted lilac. The thin blue carpet was threadbare in places, and stained with drips and drops of lilac paint. The faded floral curtains were mounted on a wonky, plastic curtain-pole. I bought a double bed, but was startled to discover the prices of brand new headboards and resolved to find one in a charity shop (I never found one). The only other furniture was an wobbly IKEA wardrobe left by the previous owner. 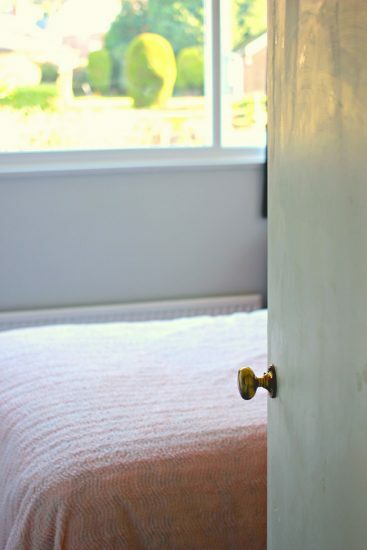 This was our guest bedroom – and it was so utterly unwelcoming, I found myself apologising whenever guests came to stay. Our house is a 1960s semi, with square rooms and long, high windows. Right now these 1960s houses are often regarded as a tired style, but I’m a vintage girl at heart. When it comes to style and design, I’ll take mid-century modern over current fashions any day. When decorating the guest bedroom, I knew I wanted to go for a mid-century theme. 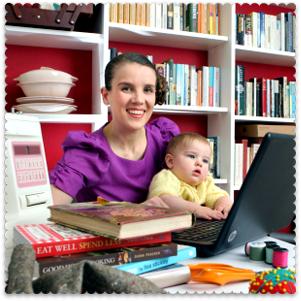 Also, while I was on a tight budget – as in, statutory-maternity-leave tight – I wanted to make the room as comfortable and welcoming as possible. 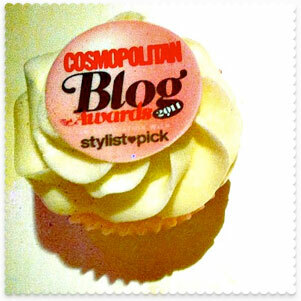 Basically, I wanted it to be all-round lovely. So although I scrimped on budget, I wasn’t prepared to scrimp on quality. So that’s limited edition Graham & Brown wallpaper, a stupidly-posh Schreiber bedhead (RRP £449) and a set of G-Plan bedroom furniture. See, I said I wouldn’t scrimp on quality! The cost for that lot? A little over £600, including the wallpaper paste. Now I don’t want to show off too much here. I did make two purchases for this bedroom that, while heavily discounted, were still jeffing expensive. (That Schreiber bedhead was one; the carpet was another). I’ll come to those at the end. I was lucky to have people to help – and VERY lucky to have people in the family with plastering knowhow. When I was in the later stages of pregnancy and it was uncomfortable to move, let alone decorate (my son was born weighing 10lb, which explained a lot…) , my mum and stepdad came to visit from Essex, 250 miles away. They emptied out the guest bedroom and plastered it. Then, when the plaster dried and my parents-in-law came to stay and meet the new baby, they did the washcoat (half white paint, half water) on the walls and ceiling. Heroes, all of them. My husband painted the walls. Then my mum and stepdad came back and painted the skirting-boards and radiator a gleaming white. Honestly, I am spoiled. In the guest bedroom, we papered two walls and painted the other two a pale, soft grey. I know grey paint is all the rage at the moment, but I’m not sold: a lot of the time, the grey-painted rooms look dingy to me. It took a while to find a shade that was soft and light, and which helped open up this modest-sized room. My chosen shade: Grey Lace from the Crown Paints Period Collection. You can get it at Homebase for £15.99 for 750ml, but that’s dear. Paint Direct does a better deal on this paint: £22.99 for a 2.5 litre pot, plus £3.49 delivery. I didn’t feel the need to buy many accessories for the room: it isn’t a big guest bedroom, and that wallpaper is busy. I looked high and low for a candlewick bedspread, eventually finding one in the House of Bath catalogue. I suppose that made sense: House of Bath caters to an elderly demographic, and the market for old-fashioned bedcovers is narrow these days. I love this peach candlewick bedspread: it’s garish but distinctive. It’s also good quality and hardwearing: my toddler, with his chocolatey paws, has seen it into the washing machine and tumble dryer on a number of occasions now. This bedspread retails at £69.95 on the House of Bath website, but I picked it up for £34.95 when a half-price sale was on. If you register on the House of Bath website, you will get an email when the next sale launches: you will also get a 10% off code on your birthday, and (at the time of writing) 20% off your first order. 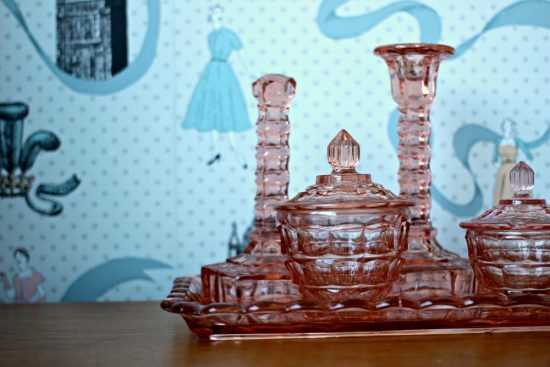 The pink glassware came from a charity shop in Frinton on-sea: £5 for the set. I didn’t notice at the time, but one of the glass candlesticks has lost its top: if you look carefully, you can see that it has been carefully filed and buffed to a smooth finish. I have kept it: clearly, somebody treasured their pink glass. A few years ago, when it was the Queen’s Diamond Jubilee and there was a Royal Wedding and British memorabilia was everywhere, I won a roll of beautiful wallpaper in an online competition. It was limited edition Graham & Brown wallpaper called Jubilee Design, and it was awesome. 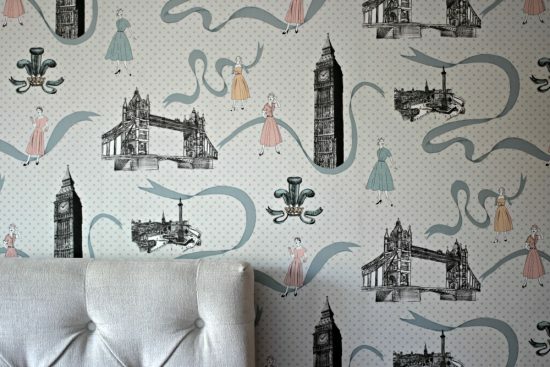 The wallpaper was illustrated with pictures of 1950s ladies in New Look dresses, with Big Ben and Tower Bridge in the background. I had a problem: a single roll of wallpaper doesn’t stretch far. Not unless your wall is very, very small. But I loved it and I wanted to find a use for it, so I hoarded it. 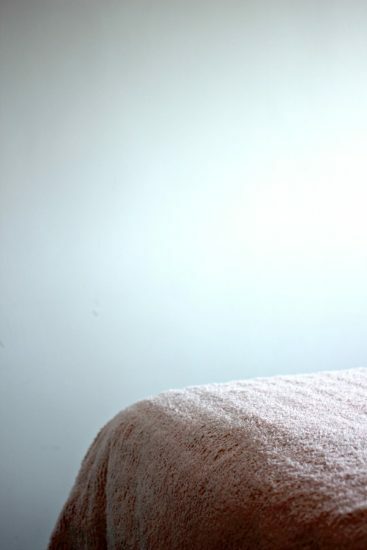 When we moved into this house and wanted to decorate the guest bedroom, I knew the wallpaper would be perfect… and I wondered, given the time that had passed, if I could find old rolls being sold cheaply. I lucked out on the first go: when I checked the Graham & Brown website, the wallpaper was still there – on clearance. It had been reduced to £10 a roll. I bought two rolls for £20, with an extra £4 shipping. So I ended up with three rolls of tip-top designer wallpaper for £24. What can I say? Sometimes, unreasonable hoarding pays off! The Jubilee Design wallpaper is no longer available on Graham & Brown’s UK website, although it is still sold on the US website for $35 a roll. I found an amazing wallpaper on WallpaperDirect, with illustrations of ladies in vintage fashions, but it is £165 a roll (glurk). How I love mid-century G-Plan furniture. The trouble is, it has soared in popularity and now everybody loves it. Even my local charity shop, when they have old G-Plan furniture donated, ship it straight off to waiting customers in China. The vintage emporium near me used to have a entire floor dedicated to furniture, with lots of G-Plan – but it was all so expensive. The going rate for a wardrobe was £175-£225 – and I wanted a matching set of furniture for the bedroom. 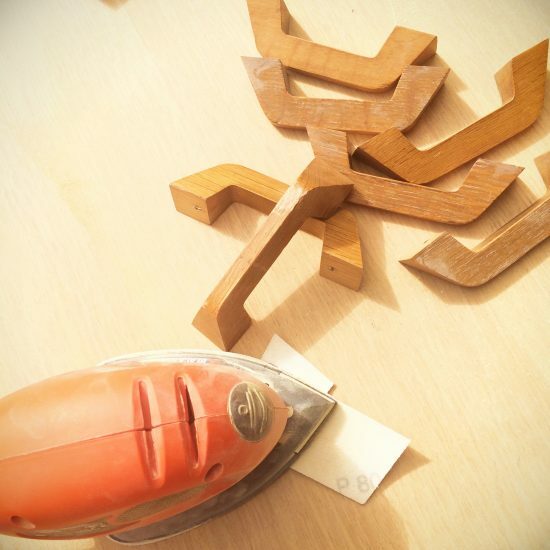 I needed a Plan C. I found it on Shpock, the app billed as a virtual car boot sale. It’s a little like Gumtree, with people in your area offering their preloved items for sale – but with plenty of pictures. 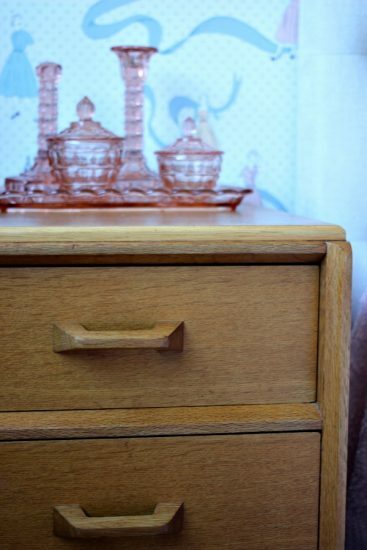 On Shpock, I found a set of E. Gomme bedroom furniture – wardrobe, chest of drawers and dressing table – going for just £80. I negotiated the price down to £70 (something else you can do on Shpock) and we went and fetched it. This furniture was 50 years old and and had clearly been loved and used for a lot of that time. The finish was worn away in places, and the set was in need of some TLC. But it was solid, sturdy, fully functional – and a great find. The original receipts were dated 1955 and 1957, from furniture stores in Bradford: biro handwriting on yellowed, crumbling paper. This is an early G-Plan stamp: the ‘EG’ is for the traditional British furniture manufacture E. Gomme, which began producing the first G-Plan furniture in the 1950s. This bedroom suite is from the ‘Brandon’ range, which was extremely popular. Something else I like about this furniture set is that because it is so sturdy and ubiquitous, there are lots of G-Plan Brandon items still around. If we want to buy matching items at any point in the future, they shouldn’t be too difficult to find. I’ll have to look hard to find bargains as good as these though. My husband renovated the wardrobe and the chest of drawers as a wedding anniversary present (it helps to have a woodworker in the family). He took off all the handles, sanded everything down and refinished it all. He did an amazing job: I love it. 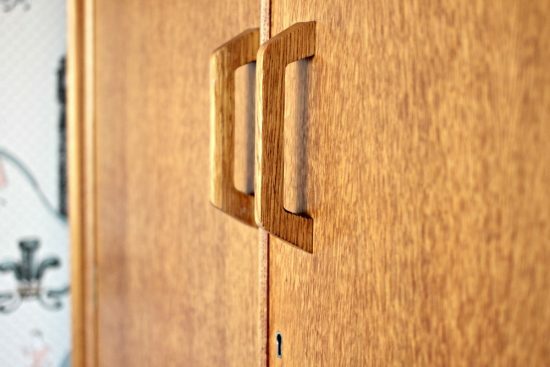 The wood is oak and I like the small details of the design: the edging and the way the grain on the side strip above is at right-angles to the grain of the wooden doors, for example. There isn’t enough room in our guest bedroom for the dressing table. It’s prettier than the drawers but to be honest, we needed the storage. Right now the dressing table is still out in our garage. My original plan, at the time of purchase, was that we could renovate it and sell it on for more than we paid for the three-piece set. Free G-Plan: wouldn’t that be great? Sadly the lock to the wardrobe door is missing. 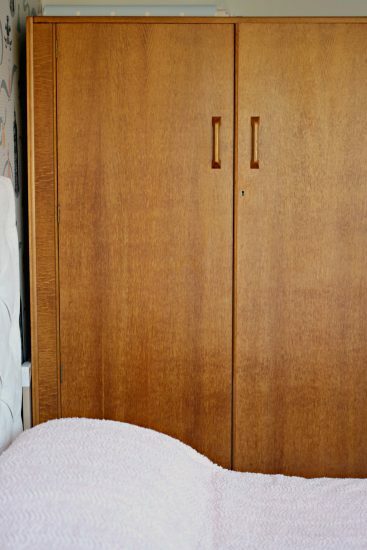 I wish we had it: Thrifty Kid likes to hide in this wardrobe. It’s so spacious, he likes to pretend he’s in Narnia. When he comes out it’s like a bomb has gone off in there. 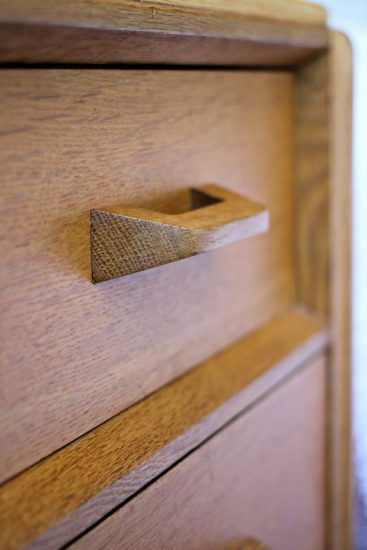 If you like G-Plan furniture in the Brandon style, keep an eye out in charity shops because it does pop up there. 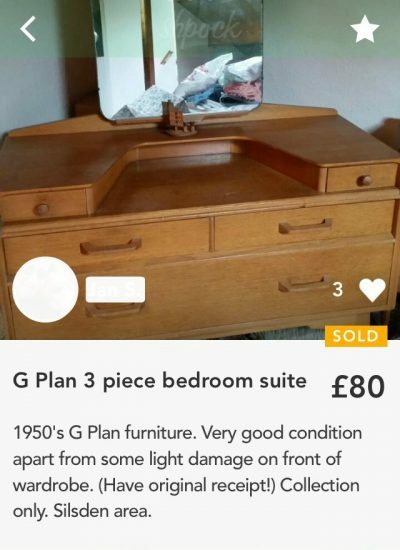 Another good place to look is this little corner of eBay: because lots of Brandon G-Plan was made, I guarantee you that you will find the wardrobe, drawers, dressing table and more there. 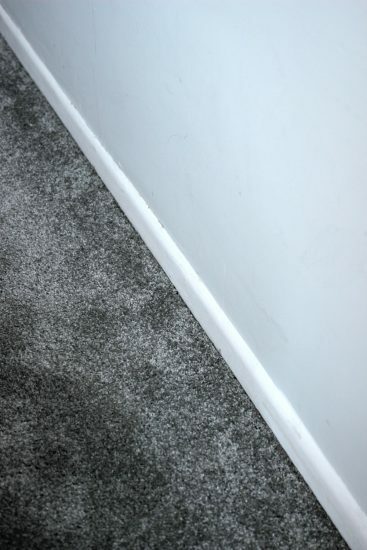 The carpet is a Milan Saxony Plain Carpet in Anthracite, from Carpetright. It’s hardwearing, but feels thick and plush underfoot. It also comes with a lifetime stain warranty, which is handy when you have two small children. This was one of my big spends, but even so, I think it has provided good value for money. At the time of writing, you can kit out a room the size of our guest bedroom with this carpet for less than £300. That price includes the door bar, grippers and underlay. The curtains are Chenille Grey Lined Pencil Pleat curtains from Dunelm, which sell for £45. I still need to take them up – like a lot of 1960s houses, ours has short windows – but I’m very pleased with them. They are readymade, ready-lined – and the lining is so thick, these velvety curtains are like blackout blinds. I’ve left my splurge until last: well-made headboards are crazy expensive! This Schreiber Portisham double headboard was £270 from Homebase. That was the sale price, when Homebase was clearing all its Schreiber stock last year: the full price was £449. It is solid, very neat and fits into the room perfectly but I am not going to pretend that, even as a clearance buy, this was a thrifty purchase. The Schreiber brand rights belong to Sainsburys and, if you like this style of furniture, you can still find some Schreiber items on the Argos website, which is also Sainsburys-owned. 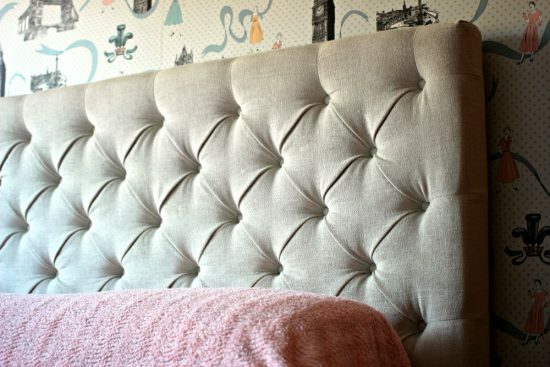 If you are feeling confident – well, more confident than I was – you can make your own tufted headboard. There are lots of tutorials on Pinterest. This guest bedroom was put together, piece by piece, over the course of about a year. The walls came first and everything else followed. The room still isn’t complete: I’m looking for a picture to hang on the big blank grey wall facing the bed, plus a new light fixture. But I like it, decorating like this. You can save up and buy the right things, at the right prices, when they happen to come along. It’s the DIY version of Slow Food. Paint: Grey Lace from the Crown Paints Period Collection, from PaintDirect, £22.99 for a 2.5 litre pot. 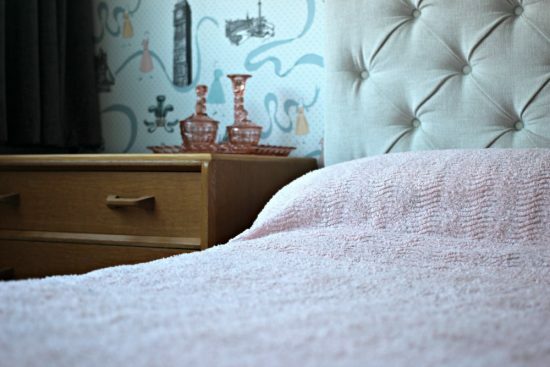 Bedspread: peach candlewick bedspread from House of Bath, £69 (but wait for the next sale). G-Plan Brandon furniture: here are the latest listings on eBay. Carpet: Milan Saxony Plain Carpet in Anthracite, from Carpetright, £284. 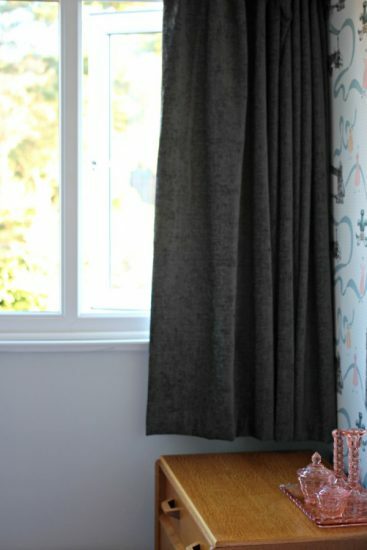 Curtains: Chenille Grey Lined Pencil Pleat curtains from Dunelm, £45. A 1950’s bedroom would be such a cool theme, very creative! Also, I love how you provide tips for those on a budget! How cute is that wallpaper! I would have loved to see what the room looked like before and after too. Those little touches you did are awesome. That looks super cool! I love the look of retro! That wallpaper is super awesome! I dig that wallpaper! As a girl of the 50s/60s, I am right there with you with midcentury is one of my favorite styles. Omg just love what you did with the room!!! Such a chic theme you picked. I love the way, you decorated it. Everything turned out so well and so nicely pulled together.